Latest tractor buy. 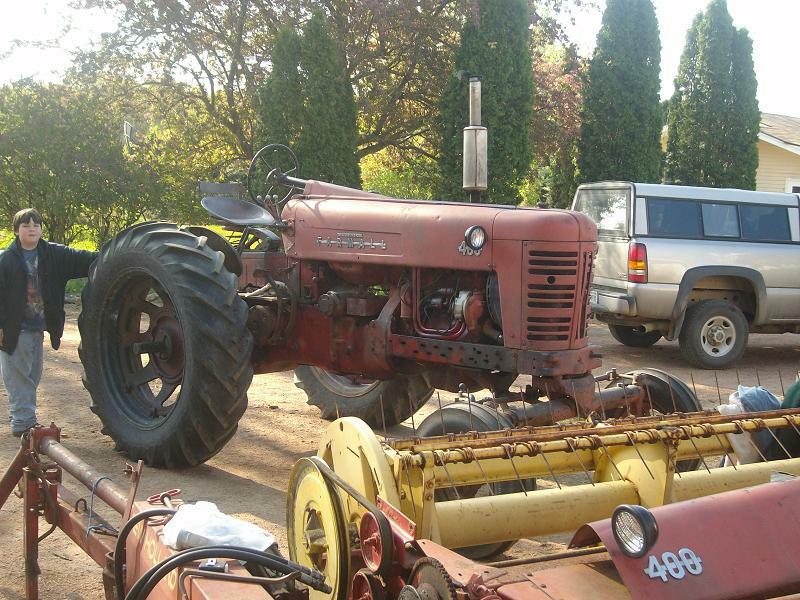 A late model Farmall 400. The milking herd. Gidget, Cricket, Gwen, Misty, and Christy. Lady standing and Star laying down. 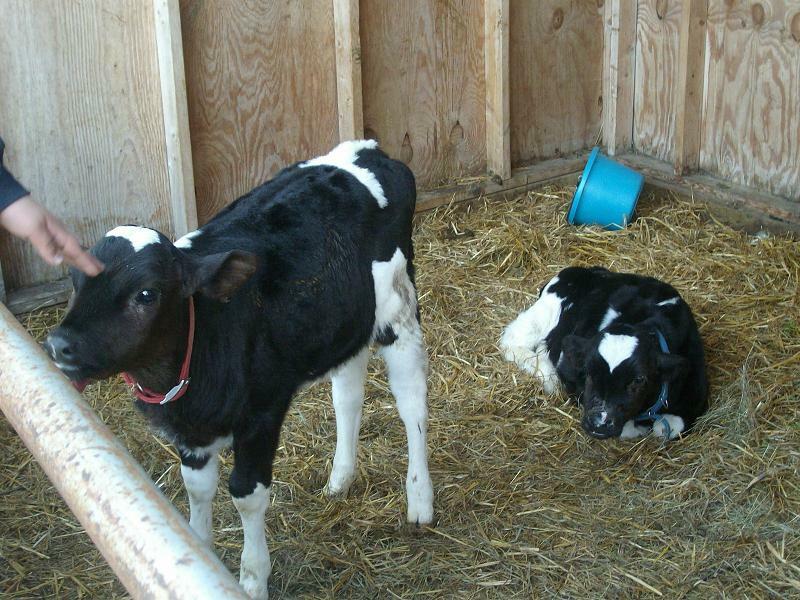 Our 2 little holstein heifers. Big picture of pasture setup. 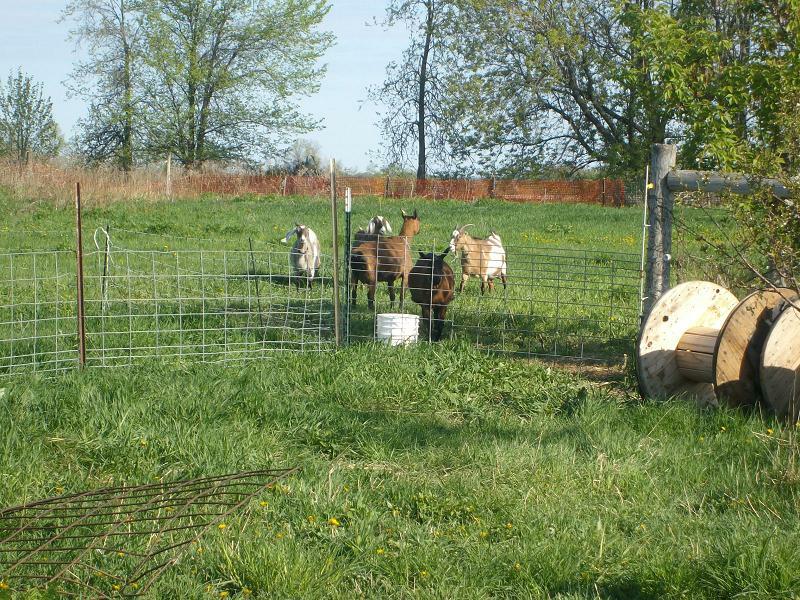 The weaned goats out on their new pasture. 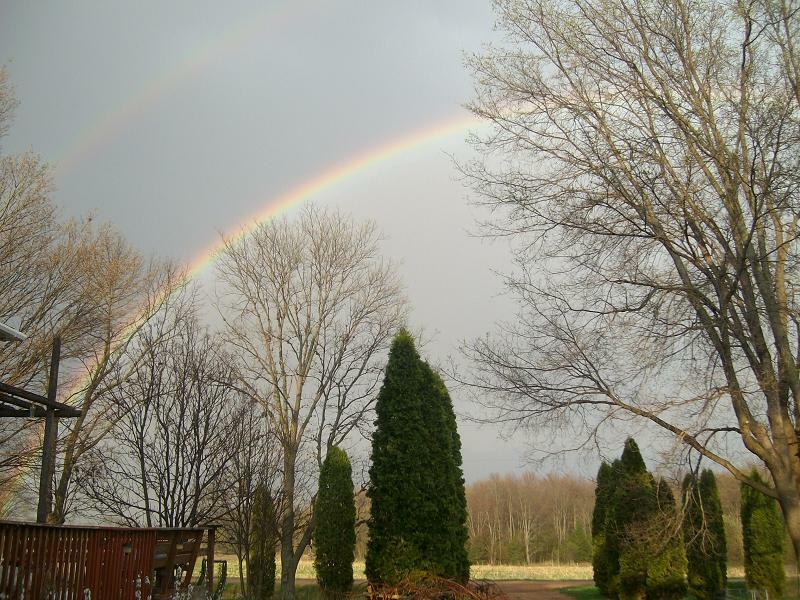 A beautiful double rainbow that showed up 2 weeks ago. Heading out to plant some corn. 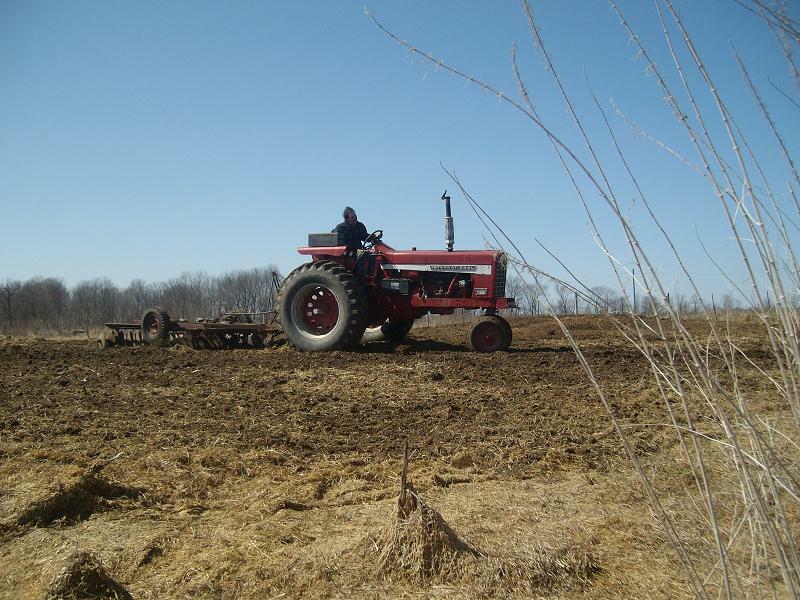 Here's my buddy with the biiig tractor and chisel plow. Really got a lot done quickly. Got the cat 22 busy this spring and made the feed lots more level than they were. Planted 2 to oats/alfalfa and 1 to corn. The corn planter worked great but I broke off one of the markers on the way out to the field, caught a tall fence post somehow. The drill worked OK but had a bit of cleaning to do as I hadn't got all the seed out of it last year. The oats are up and the corn has sprouted but hasn't poked through yet. Good thing as we had a frost this week. Made a bunch of fence on the back acre. 1/3 is for the goats. 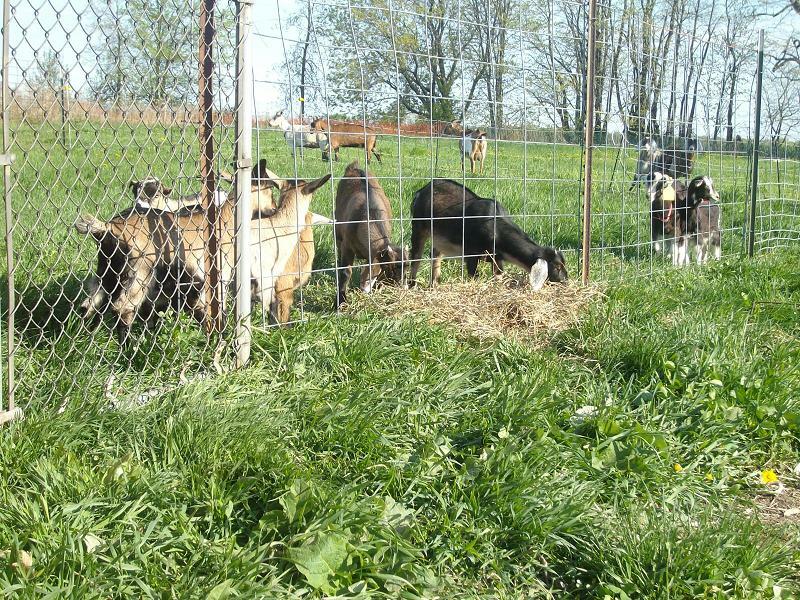 Less than 1/6 for the little goats and the rest is for the steers. Everybody is happy to be on pasture. 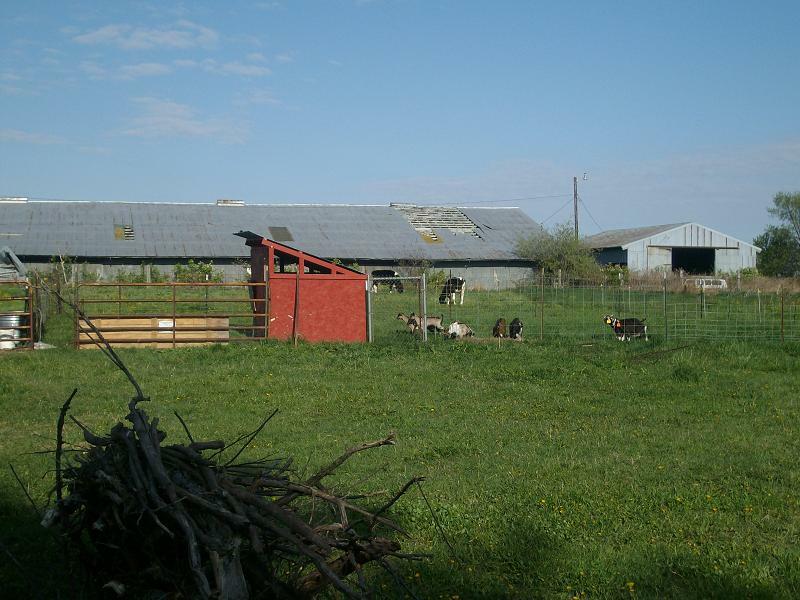 We have 8 little goats weaned and on pasture and another 6 to go. Took 4 goats to auction and brought back 4. Ran into an Amish friend that had brought a nice looking Alpine that was bred to freshen in June (Petunia). I bid on her and got her for 120. Picked up a couple of Toggenburg looking doelings for 45 apiece and a little white doeling for 16. 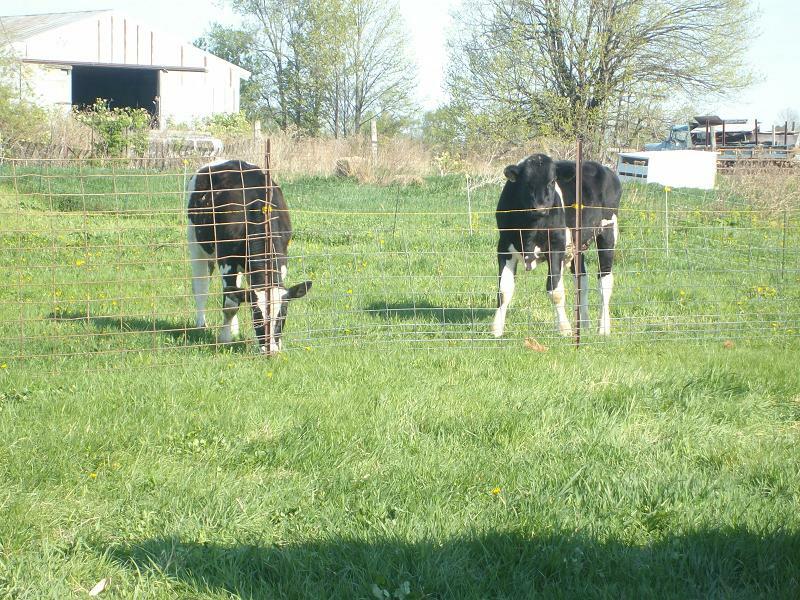 The Togs(Heidi and Brigitte)are weaned but the white one (Marsha) isn't. Also picked up 6 guineas and 4 Barred Rocks. The guineas decided they didn't want to hang around the yard but are close by. The rocks fit right in with our free range operation and add a nice contrast to the browns we have. Spent yesterday morning pulling honeysuckle out and moving the winters supply of manure fom the steer lot. Found a broody duck hen with a clutch of eggs under one of the honeysuckles, hope she hatches a few. The other hens are showing no sign of getting broody. Buddy of mine is lining up some hay land for the summer so we decided that some different equipment was in order. 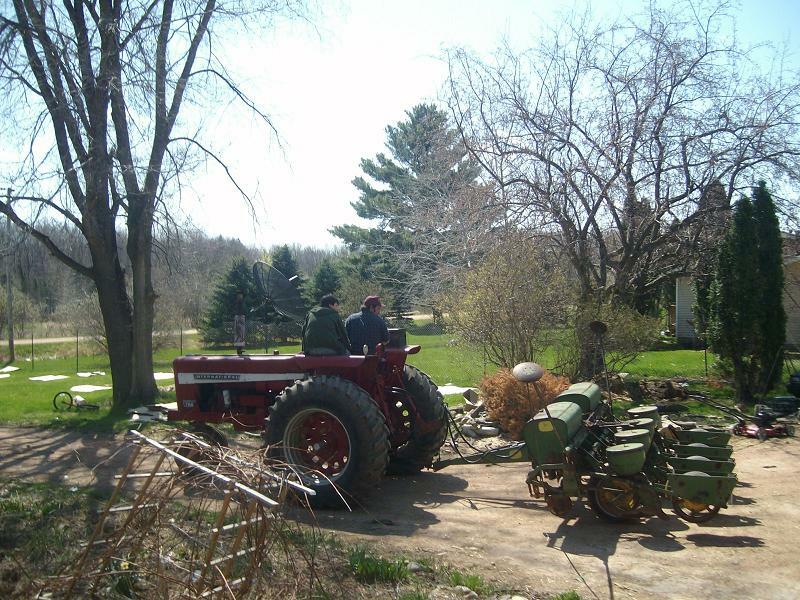 I pulled a nice little haybine out of the shed I bought and will be fixing that up. 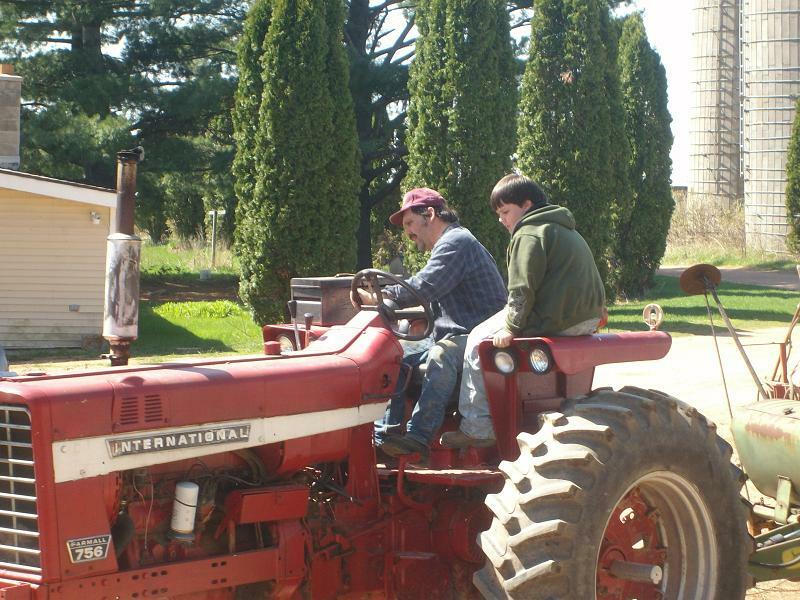 We bought a decent Farmall 400 at an auction Saturday. Will take a little sprucing up but will have the power to pull the baler and a wagon without too much strain. Plus it has good hydraulics which we'll need for the haybine. Haven't been out in the garden much. Still trying to get the Sears tiller fixed. Been cold and wet as well. 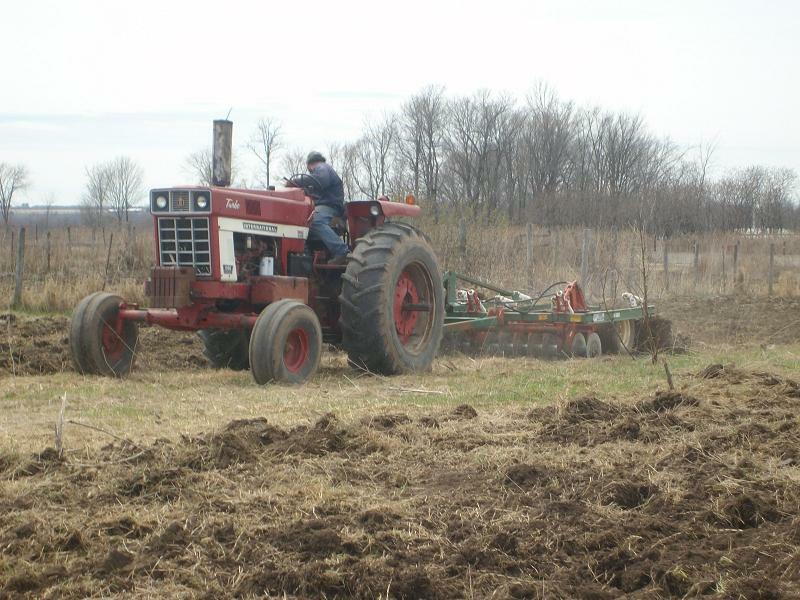 We did borrow the folks big Troy Built and have started tilling in some of the manure I bulldozed yesterday. We have planted all of the leftover potatoes from last years crop, a few tomato starts and a bunch of garlic starts we picked up last week. Tammy canned 4 qts of rhubarb pie filling and there is lots of rhubarb ready to pick. We had lots of blossoms on the cherry bushes and wild plums. Cherry trees look like they should blossom out well as does the MacIntosh. Lilacs and the flowering crab are just getting ready to pop. Should be really colorful around here soon. Having issues getting pics uploaded but hopefully I can get that recified shortly. Kinda changing the focus of what we are doing on the place lately. We do seem to be getting away from self sufficiency and heading towards farming. I suppose up until big factory farms the two went hand in hand anyway.